Directions coming soon. I went to the park in the fall. Here's another one. More details to come soon. So, it's been a while since I posted. 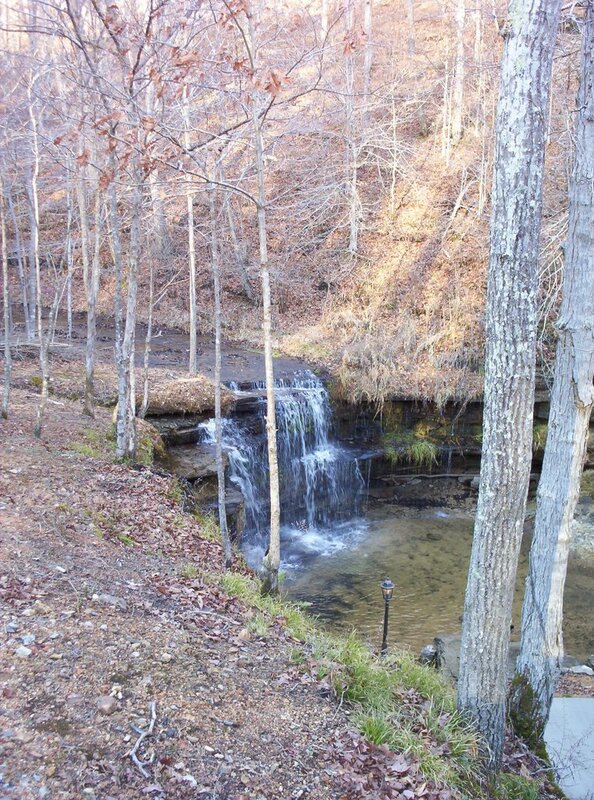 Here are a few pictures of Jackson Falls just off of the Natchez Trace Parkway, not too far from Nashville. I'll add directions soon. 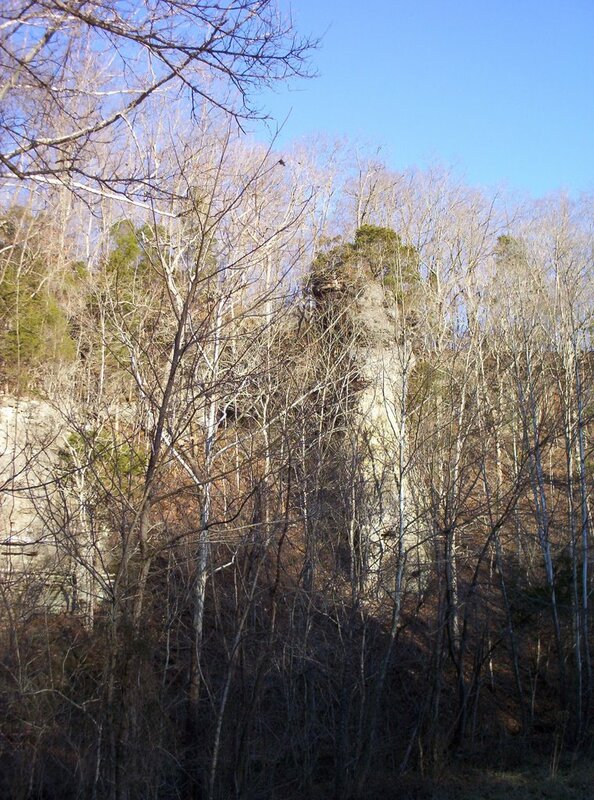 Bay's Mountain in Sullivan County Tenn. 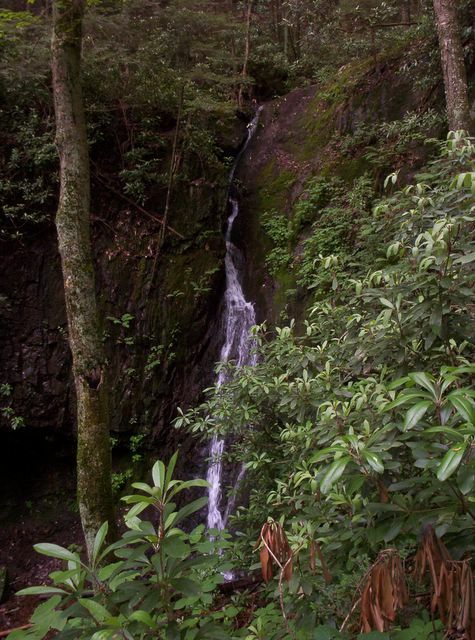 Here are some pictures from Bay's Mountain, where you can find Bay's Mountain Falls. Ok, so this one is not in Northeast Tennessee, but I had time to kill over the holidays (we were in Franklin, Tenn.) and visited the closest waterfall I could find. 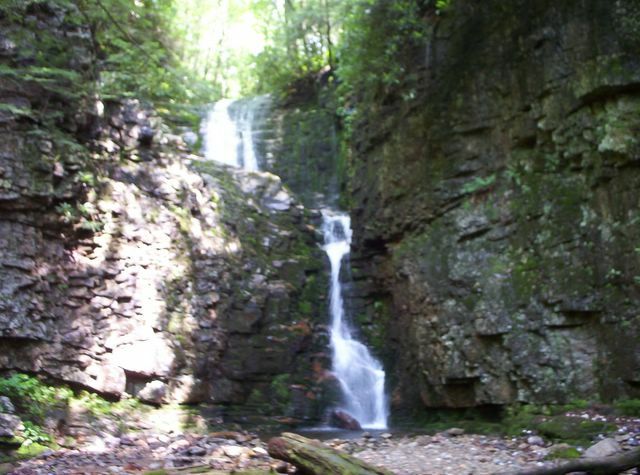 Old Falls, is about 20 minutes off of the Natchez Trace Parkway. As you can see, a house was built in the middle of the site. 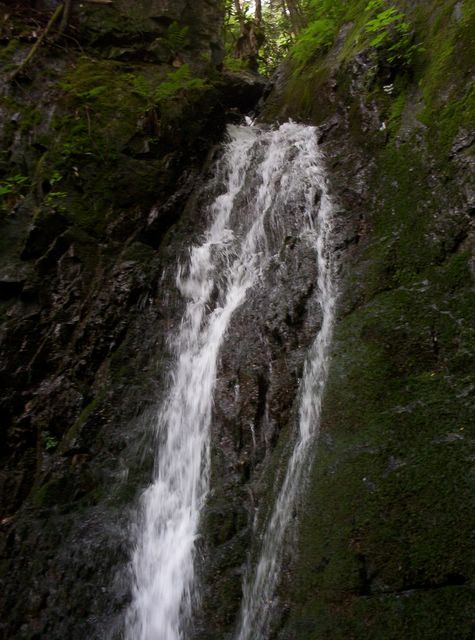 I have made this blog so that the public can go and visit waterfalls for free. There have been a few people who have expressed interest in guided tours. If others are interested please contact me by e-mail or by leaving a comment. I am trying to determine what the level of interest is. I couldn't do it for free because of gas costs. And, if a lot of people were interested I would have even more costs because of rules for bringing people to national forests for a fee, i.e. 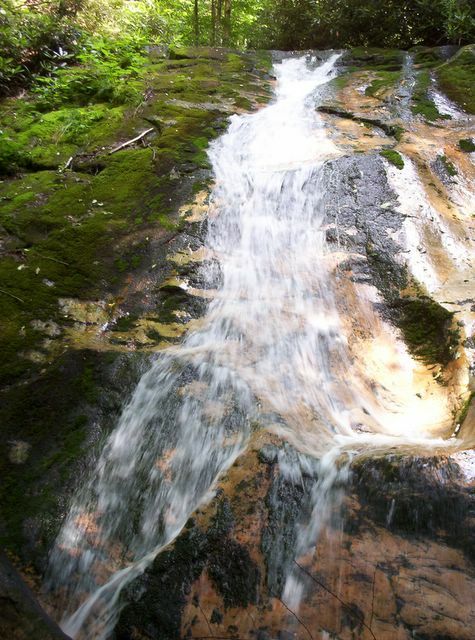 cpr training costs, national forest licences and insurance. But I would love to help others experience the beauty of this region. This appears to be Pine Ridge Falls, not Sill Branch Falls, like I first thought. Both are in Unicoi County, but are very close to Washington & Greene Counties. There are also some nice cataracts to see on the way. These falls can be found down a gravel road and then a short 1/2 mile hike. Directions: Drive to Clarks Creek Road from state road 107, located 4.9 miles west of state road 81, going toward Greeneville. Clarks Creek Road is also 15 miles east of U.S. 321, coming from Greeneville. 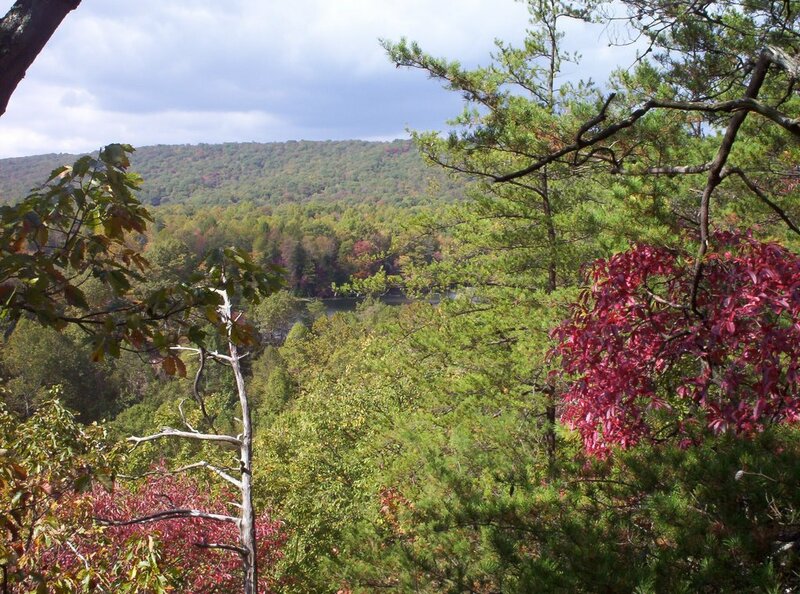 Drive 1.5 miles south on Clarks Creek Road. The road turns to gravel and you will drive another 1.6 miles. Here the road crosses the creek a third time and then, after another 0.4 miles, a large unsigned turnout serves as the parking area for the trail. 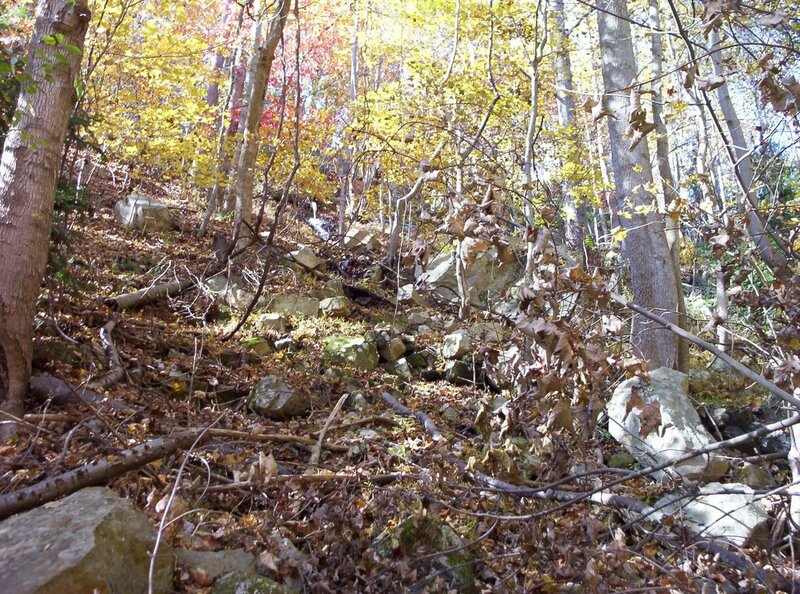 The trail is a little rocky, but bear left at all junctions. 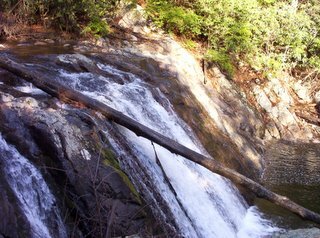 After 0.4 miles you will cross the south fork of Sill Branch and then hike another 0.1 miles to the end of the path at the falls. 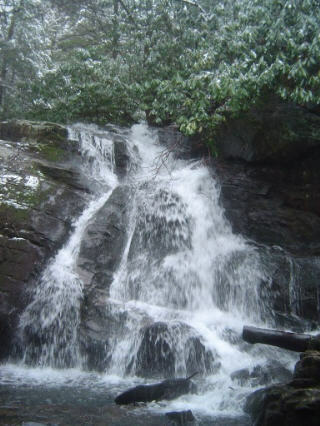 If you get confused the falls are fairly loud. A few cataracts are loud, but don't mistake them for Sill Branch Falls. 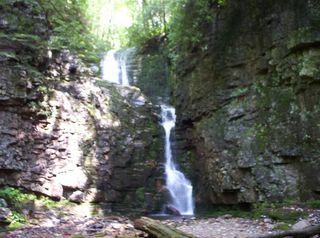 Here's some photos of Kelley Falls in Greene County. 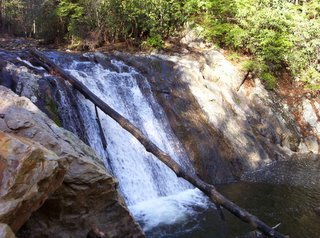 Dudley Falls is just two miles down the road. The great thing about these two falls is that a paved road takes you right to both. However, in December 2005 the road was closed to cars for renovation. You can still walk though and I'm sure it will be done soon. Also, this area is great for trout fishing, especially for fly fishing. Directions: Drive 3.4 miles east of state road 70 on state road 107 to Rollings Chapel Road, the way to Paint Creek Camp. (107 disappears for like 15 miles and then reappears. If you are coming from Washington County & state road 81, then take state road 351 south instead of driving 107 all the way into Greeneville. 351 south will take you the 15 miles or so back to 107.) 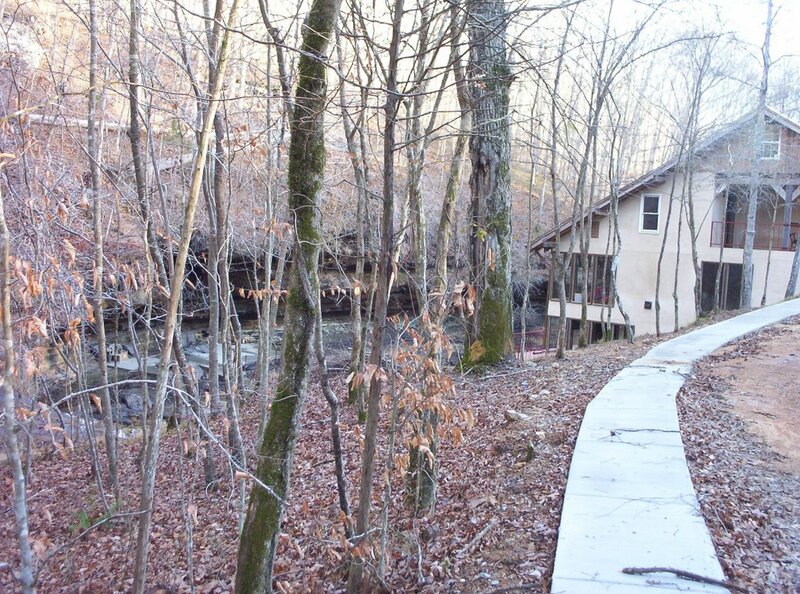 Drive 0.4 miles, then turn right on Lower Paint Creek Road. 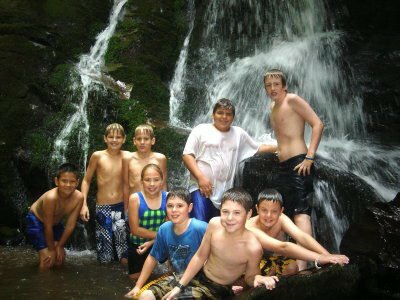 The campground and Moses Bend Picnic Area will be found after another 1.7 miles. 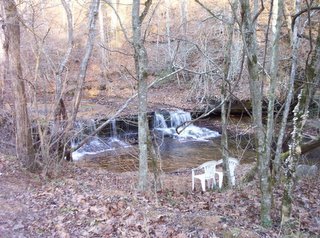 Then drive an additional 0.5 miles along Lower Paint Creek Road to a small unsigned turnout just downstream from the falls. 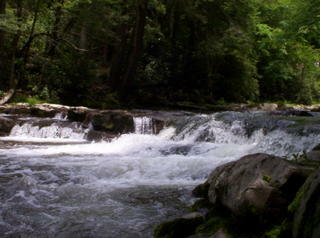 Here are a few falls, or rapids, just off of the Virginia Creeper Trail. 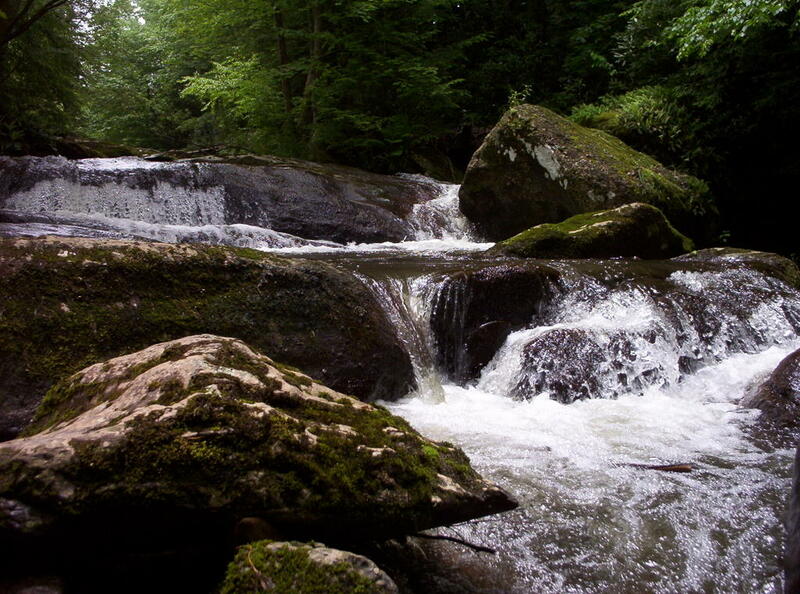 These falls, or rapids really, are not far from Johnson City and Cherokee Elementary. Directions: Drive to Cherokee Elementary School in south Johnson City. At the four-way intersection of Cherokee Road and Lone Oak Road, turn south onto Lone Oak Road (which is Dry Creek Road if you're coming from the Lamar school and community). 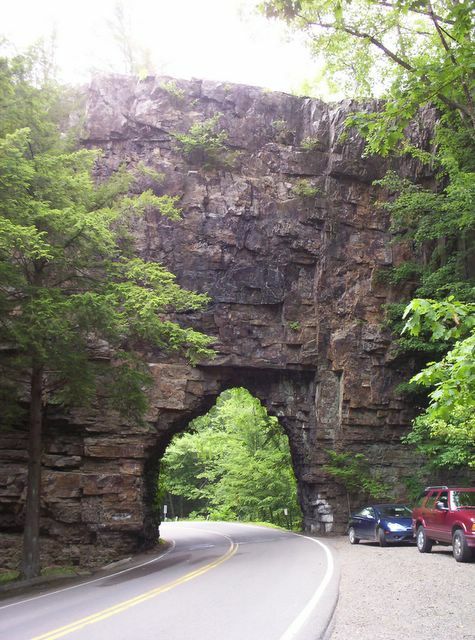 You will go exactly 7.5 miles on one of the least advertised but prettiest drives in Washington County. There will be a small parking area on the left side of the road. Park there and follow the trails down to the creeks. Be very careful not to slip and fall. Also, look out for broken glass and perhaps drunk partyers. 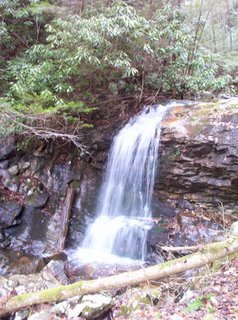 Nearby, at Buffalo Mountain Camp, are Ramsey Creek Falls and a water hole, but I have not tried to get to them. 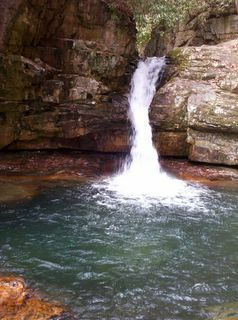 Here are some pics of Lower Rock Creek Falls in Unicoi County. I am disappointed with them. DIRECTIONS: Take Exit 19 off of I-26. Turn right coming from Johnson City and left coming from Erwin. 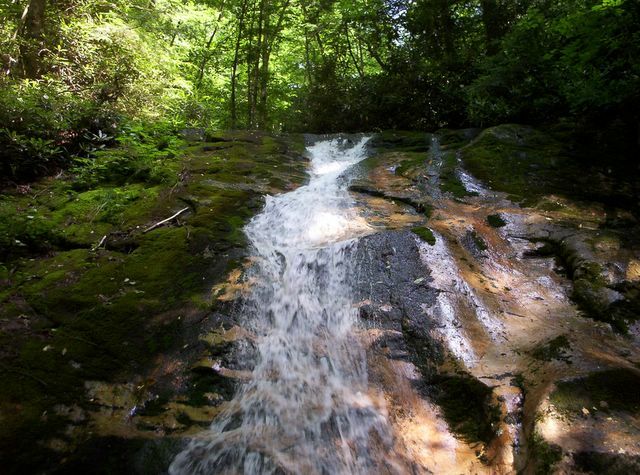 Go 0.2 mile and turn right onto Unicoi Road. Go 0.4 mile and turn left on to state road 395. Go 3.1 miles to Rock Creek Park, on your left. Drive all the way through the park past campsite loops A, B and C. There is a nice gravel parking and picnic area at the head of Rock Creek Trail. 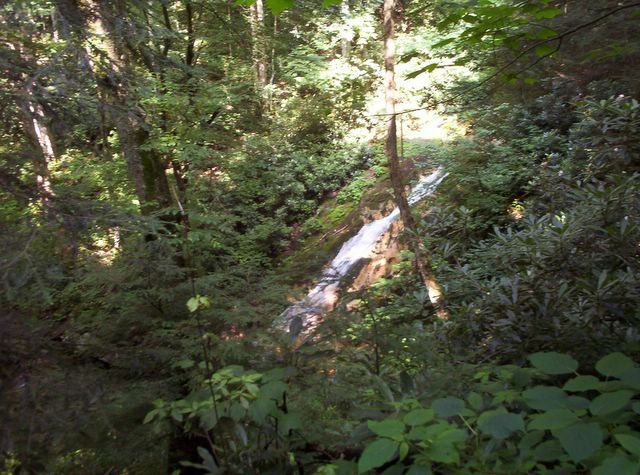 Follow the signs for Rock Creek Falls Trail and do not follow the bike trails. 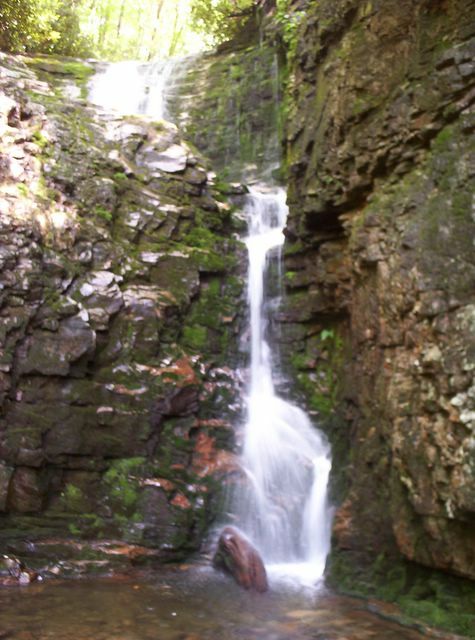 The hike to the lower falls is 1.7 miles and much of it is steep and rocky. 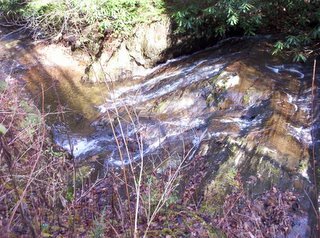 There are at least four stream crossings. There are plenty of smaller falls that you will see before you reach the lower falls. 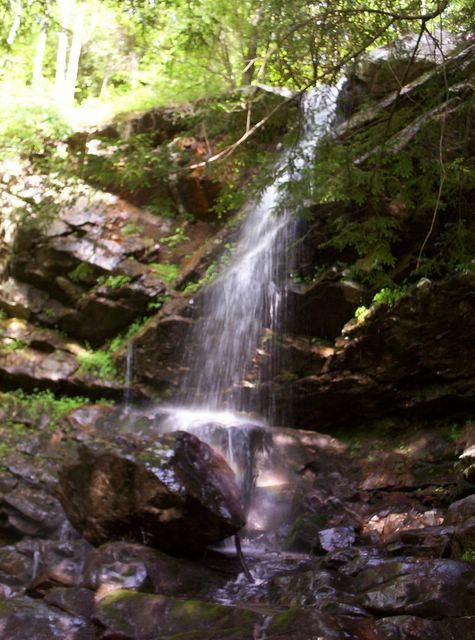 DIRECTIONS to Upper Rock Creek Falls: Continue more steep hiking past the lower falls for another 0.3 mile. 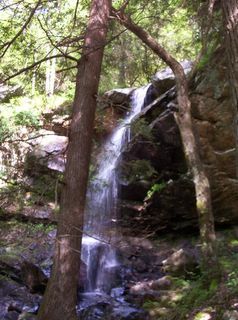 The trail ends at the base of Upper Rock Creek Falls. These falls are also known simply as Rock Creek Falls. Here are some pretty bad pictures of Upper Rock Creek Falls in Unicoi County. DIRECTIONS: Take Exit 19 off of I-26. Turn right coming from Johnson City and left coming from Erwin. 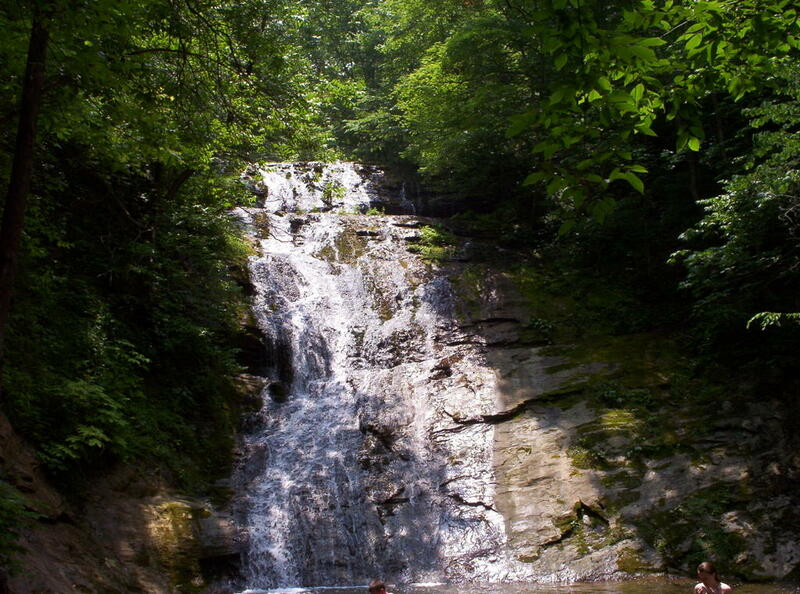 Go 0.2 mile and turn right onto Unicoi Road. Go 0.4 mile and turn left on to state road 395. 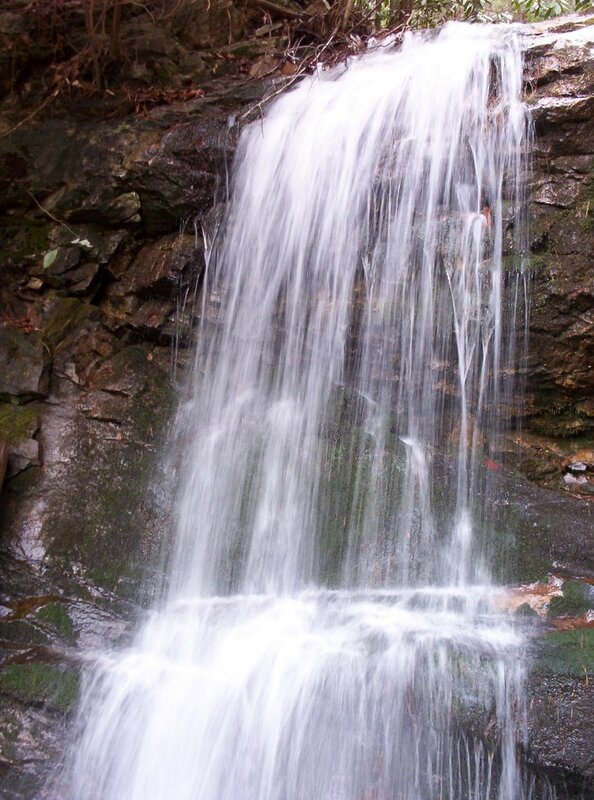 Go 3.1 miles to Rock Creek Park, on your left. 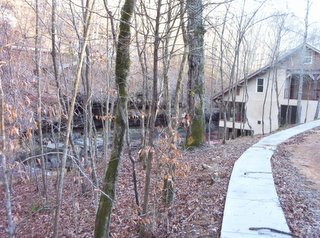 Drive all the way through the park past campsite loops A, B and C. There is a nice gravel parking and picnic area at the head of Rock Creek Trail. 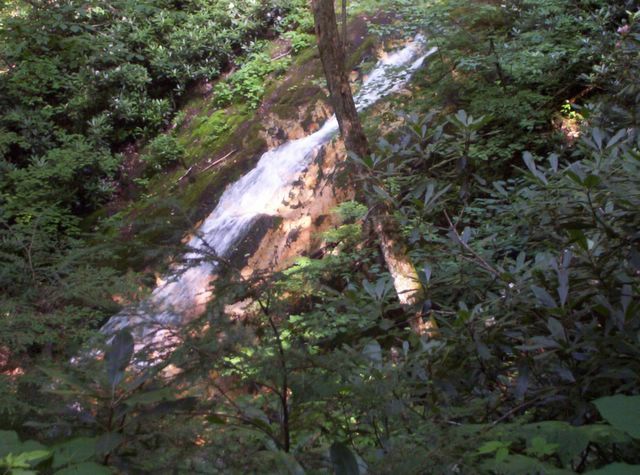 Follow the signs for Rock Creek Falls Trail and do not follow the bike trails. 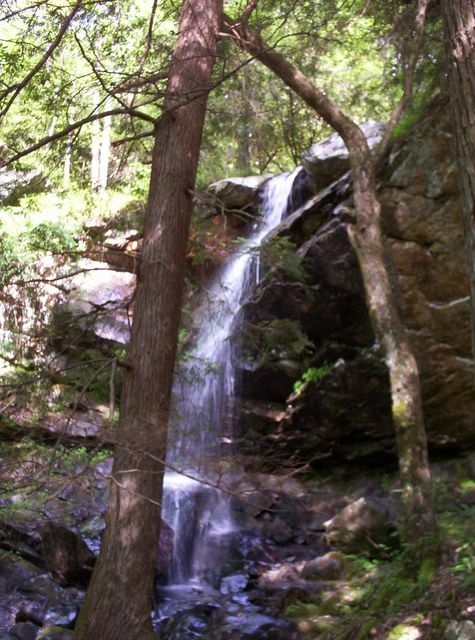 The hike to the lower falls is 1.7 miles and much of it is steep and rocky. Continue more steep hiking past the lower falls for another 0.3 mile. 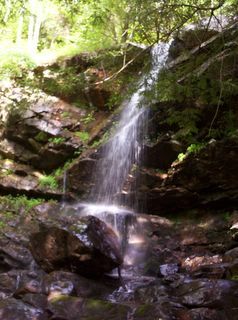 The trail ends at the base of Upper Rock Creek Falls. 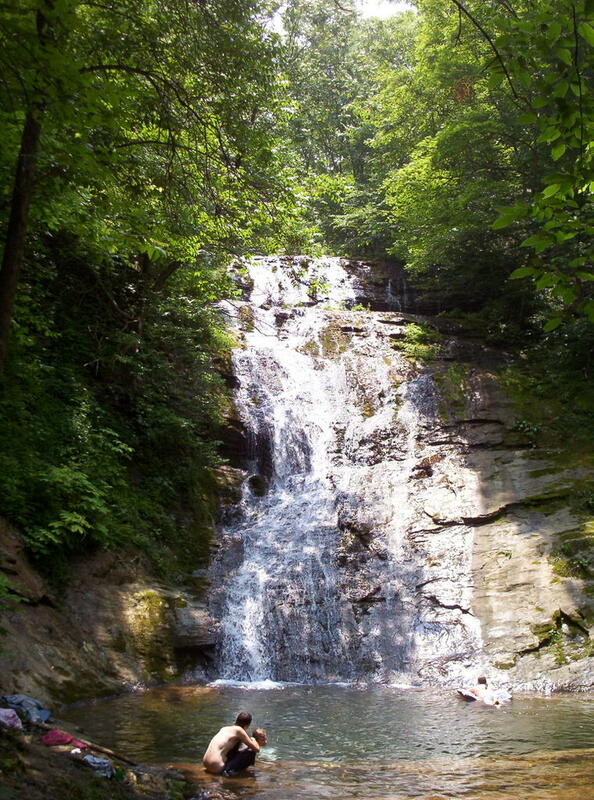 These falls are also known simply as Rock Creek Falls. There are at least four stream crossings. There are plenty of smaller falls that you will see before you reach the lower falls. 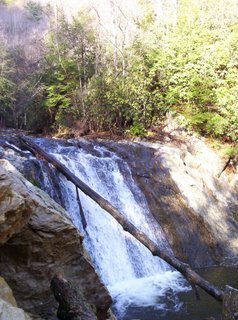 Here are some pics of Backbone Rock Falls. I have also included a pic of Backbone Rock. 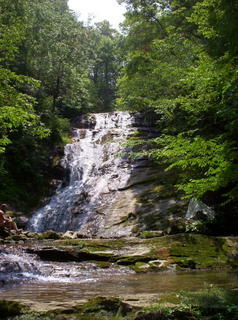 These are not too impressive, but it is a neat place to visit if you are near Shady Valley, Tenn., or Damascus, Va. 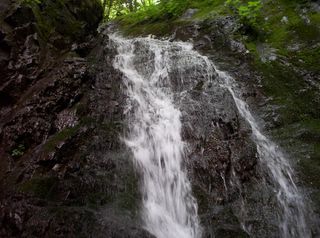 Apparently there is another cascade close by. 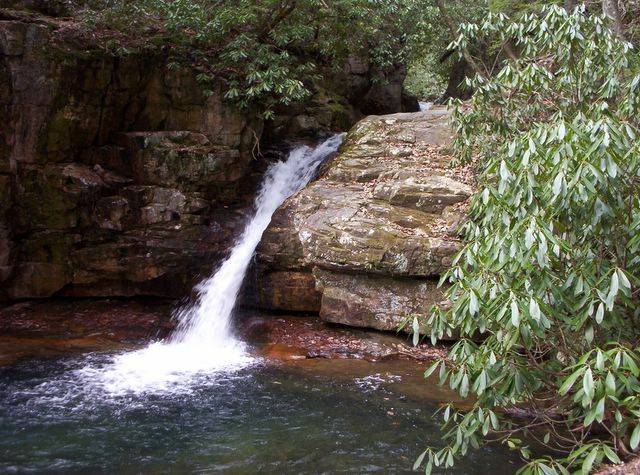 DIRECTIONS: This recreation area is 10 miles north of junction U.S. 421 on state road 133. Park at the turnout on the right side of the road, just before the tunnel through Backbone Rock. 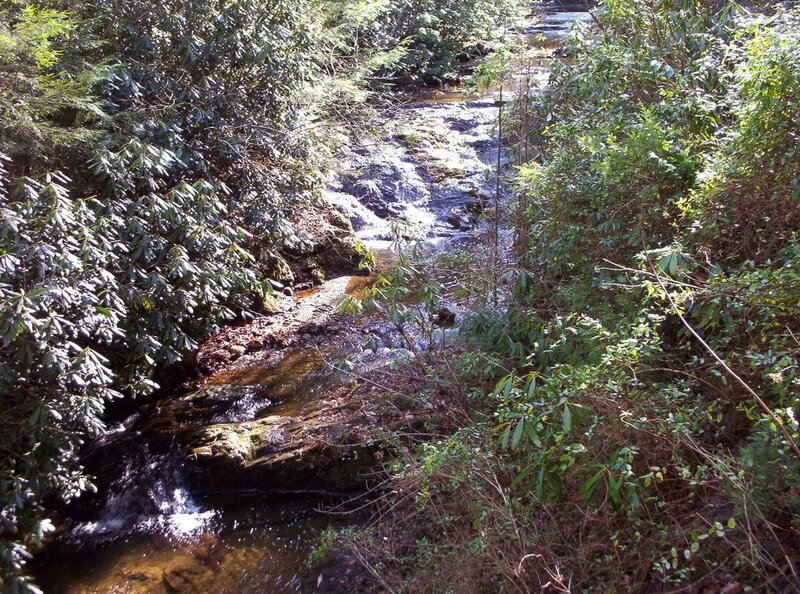 Follow the loop trail to the right, which initially follows the road before heading upstream. 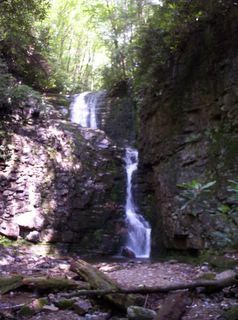 The base of the falls is in 0.4 miles from the start of the trail. 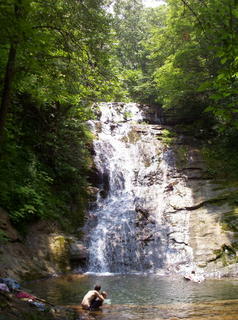 This waterfall is located in Washington County, near Unicoi County. 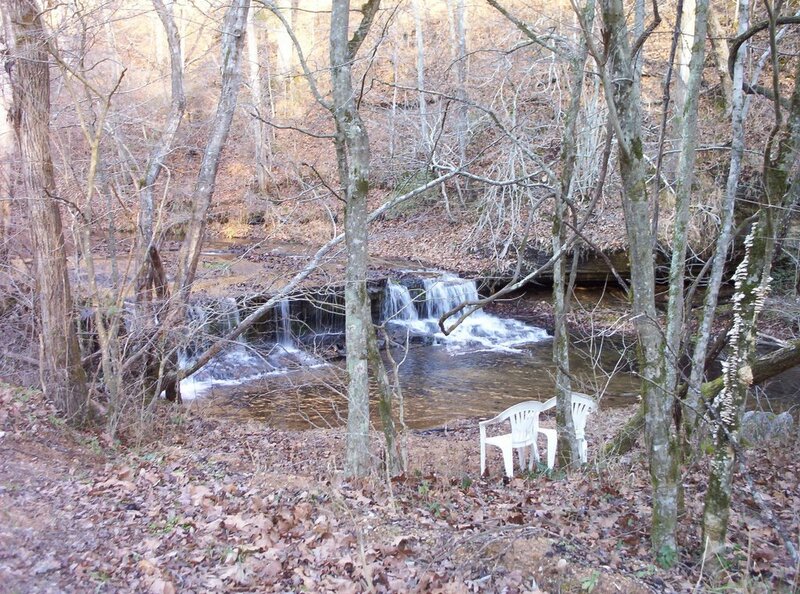 It is on private property. 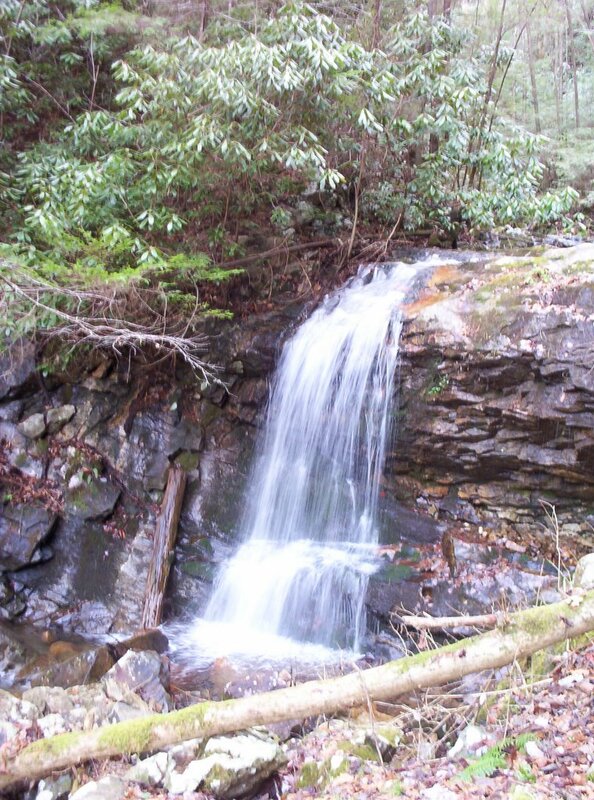 DIRECTIONS: Take exit 18 off of Interstate 26 and proceed westward on state road 81 toward Jonesborough. 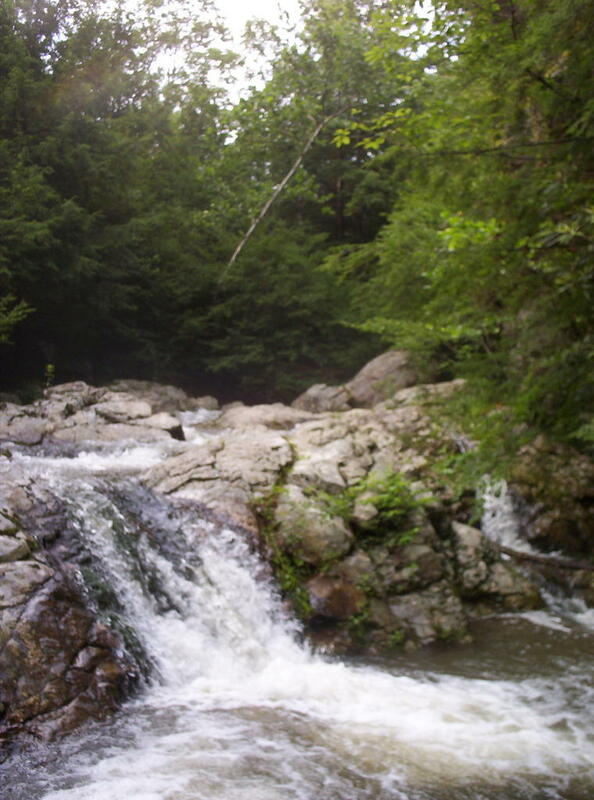 Drive 4 miles to Arnold Road, continuing straight ahead instead of cross the Nolichucky River on state road 81. 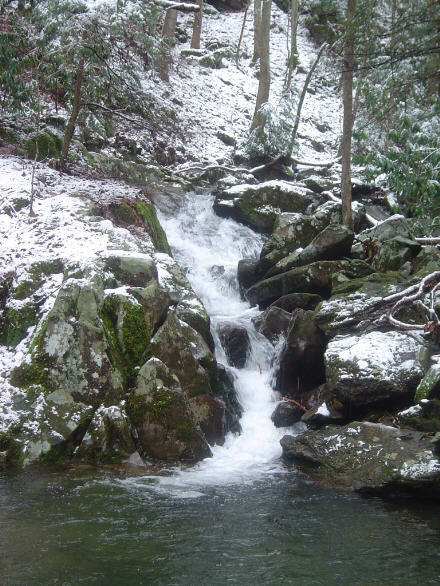 Drive 0.9 miles on Arnold Road to an unsigned turnout south of Millstone Creek, on the left side of Arnold Road, adjoining the Nolichucky River. 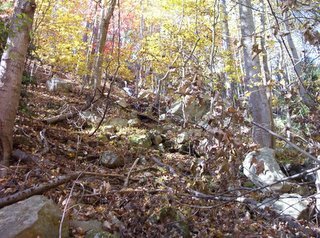 You will pass one or two previous turnouts before you get to this one. There is a small footpath across the street from the turnout. The falls are about 150 yards up the path, in someone's back yard. This is Blue Hole Falls in Carter County. 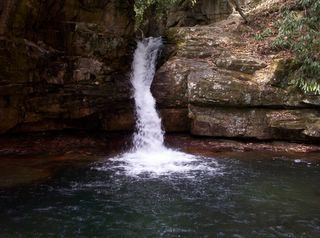 Many just call it Blue Hole. I think you can see why. 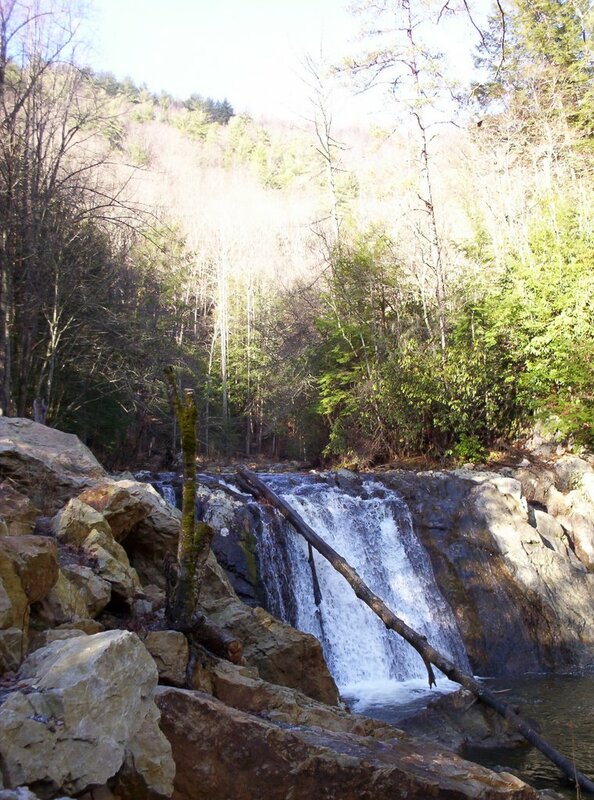 DIRECTIONS: Starting at the junction of state road 91 and U.S. 321 in Elizabethton, drive east on 91 for 10 miles. Turn left (north) on Panhandle Road at the national forest sign for blue hole. Drive 0.9 miles to the parking area. The trail to the right leads 0.1 miles down wooden steps to the base of the main falls.